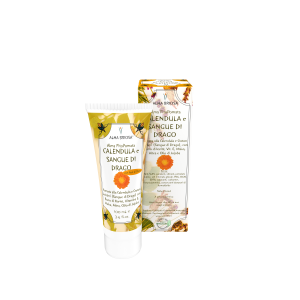 The Marigold and Dragon’s Blood ointment is a nourishing and gentle emulsion suitable for all types of skin, especially if sensitive and prone to redness. It contains Marigold, Marshmallow and Mallow extracts, known for their soothing and softening properties and Croton lechleri. This resin, also known as Dragon's Blood, is used in South America for its regenerating and healing properties. Lavender essential oil, a pleasant and delicate fragrance, also acts as antioxidant and healer. This ointment is very rich in vitamin E.
The ointment contains a floritherapic mixture, prepared with Dr. Bach’s methodology. It serves to alleviate emotional and psychosomatic uneasiness. The action of herbal extracts mixed with Dr. Bach’s remedies resolves both physical and emotional imbalances. Floritherapic mixture used: Hornbeam, Olive, Vervain, Willow, Walnut, Rock Water. Use: Apply a generous layer of ointment and massage until completely absorbed. For use on reddened or cracked delicate areas. This ointment soothes and facilitates healing as it eliminates irritation and rashes. INCI	 INGREDIENTI/INGREDIENTS: Aqua**, Vitis vinifera seed oil**, Glycerin**, Decyl oleate**, Cetearyl alcohol**, Sodium cetearyl sulfate, Calendula officinalis flower extract**, Butyrospermum parkii butter**, Simmondsia chinensis oil**, Tocopheryl acetate**, Malva sylvestris extract*/**, Althaea officinalis root extract**, Croton lechleri resin extract*/**, Lavandula angustifolia oil**, Carpinus betulus (Hornbeam) flower extract**, Verbena officinalis (Vervain) flower extract**, Salix alba (Willow) flower extract**, Juglans regia (Walnut) flower extract**, Ilex aquifolium (Holly) flower extract**, Potassium sorbate, Benzyl alcohol, Linalool**, Limonene**.